Today's announcement that Steve Perelman's OnLive may have potentially disintermediated game console providers has the blogosphere a-chirping. The company has created a new compression which allows data used for online game services to be computed on distant servers - cloud computing servers - instead of through a game console or speedy, local computers. 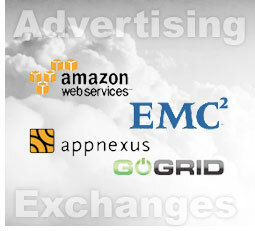 Considering the future of ad exchanges, the cloud architecture makes sense as expensive infrastructure is "outsourced" to cloud computing specialists such as AppNexus, Amazon EC2, GoGrid, EMC and others who can provide the exchange backbone and enable data providers of targeting, analytics and more for ad traders on the exchange. Another advantage of the cloud surrounds the conundrum of who owns the exchange. In the best of all possible worlds, no one owns the exchange - and everyone does. The exchange's infrastructure could be sustained through membership, data and transaction fees which feed the ongoing maintenance, development and profitability (!) of a company unrelated to the advertising trader.. i.e. not Google, not WPP Group and definitely not an IAB-like, non profit organization. Co-Founders Brian O'Kelley and Mike Nolet of AppNexus appear to have the inside track on exchange infrastructure know-how as they have recently enjoyed a well-deserved liquidity event after helping build Yahoo! 's Right Media into one of the premier ad exchanges today. "AppNexus will deliver a terascale data warehouse cloud service leveraging the Netezza appliance. This new offering will provide online advertising providers with a cloud offering that not only can handle analytics on their huge volumes of data but also offers them a flexible way to take advantage of the performance, simplicity and time to value benefits of the Netezza appliance. Additionally, the partnership will expand the capabilities of AppNexus’ offering to the online advertising community." Shlomi Aflalo, R&D Manager at eXelate Media, raved about AppNexus on LinkedIn recently in comparison to the competition saying, "The one major advantage they have over (Amazon) EC2, in my opinion, is their support. They have a very responsive and efficient support team 24X7." Aflalo added that occasional downtime has been an issue but should be expected with a very new company. And it's nothing like what happened with Carbonite. Data needs will leap in years to come as exchange traders analyze the Media Profile to understand opportunity and risk of online media. Scalable, cloud computing infrastructure appears to be a great fit on several levels for ad exchanges. Thanks for the kind words. I don't think most people realize how hard it is to provide a reliable, low-latency advertising service. Even after building 7 datacenters at Right Media, we're still learning how to do it better, and it's been fun to leverage our experience with smart clients like eXelate. For any readers out there looking for a hosting solution purpose-built for the online advertising space, please drop us a line! Minor name correction here... it's Mike *Nolet* not Mike *Nolin*! Also -- our uptime has been 99.999% on our DNS GSLB service in the past 9 months! Thanks for the updates, Brian and Mike (Nolet!). AppNexus and other cloud computers are always welcome here.